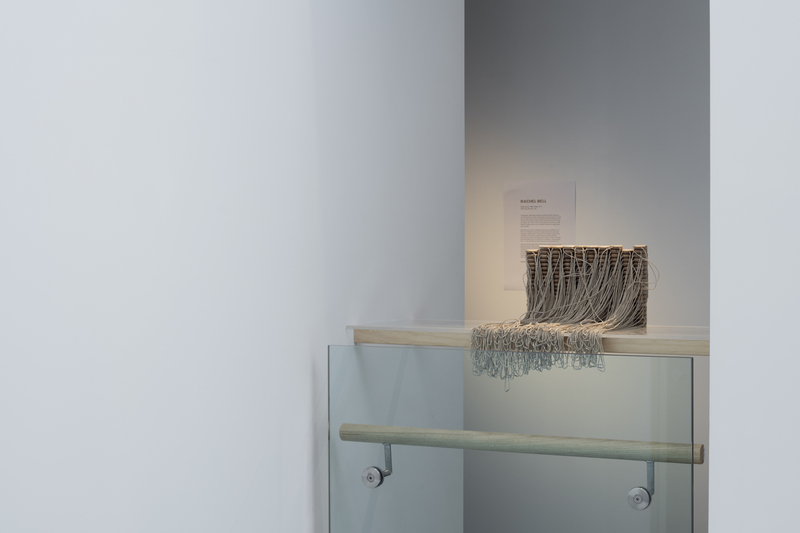 Rachel Bell, Empty vessel / Blank slate, 2015, white oak, gold leaf, cord. Photo credit: Sam Hartnett. Rachel Bell’s practice pivots around questions of transition: when does a material become an object? When does an object become jewellery? In her recent work, her query has magnified in specificity: when does a block of wood with a piece of cord become a block of wood with a piece of cord that you wear on your body? Underpinning these questions is Rachel’s curiosity in how significance and functionality is ascribed to things. Locating jewellery as something we bring into being through our individual and collective projections has consequently guided her current making concerns. For her Masterworks exhibition, Blank canvas / Empty vessel, Rachel presents 250 pendants. Made from white oak with a think film of gold leaf along the bottom edge, the materials call to mind a number of varied associations: the precious and the natural; the ritualistic and the rural; the ostentatious and the understated. The pendant’s finished form similarly invites diverse readings. For me, the shape is something akin to a toki, an object I closely link with cultural negotiation. For Rachel, the inverted ‘U’ relates to the curvature of her new vessel works or the soft scoop of her ongoing spoon series. Although these interpretations speak to the “blank” or “empty” open-endedness the works allow, it is in Rachel’s use of multiples that the production of meaning becomes particularly intriguing. As repeated versions of a single jewellery form, the pendants emulate commodities. They re-direct our attention towards mainstream production extending beyond the world of ‘contemporary jewellery’. Fashion jewellery in particular gets a bad rap, but the desire for membership, affiliation or reassurance through a reproduced piece by a known brand, such as Karen Walker (controversial, I know), is a strong pull for many. There are parallels too in contemporary jewellery: think of the fervor for a Ted Noten pink ring. Perhaps the jewellery piece that has the most significance for individuals — the gold wedding band — is at the same time one of the most common and standardised forms. 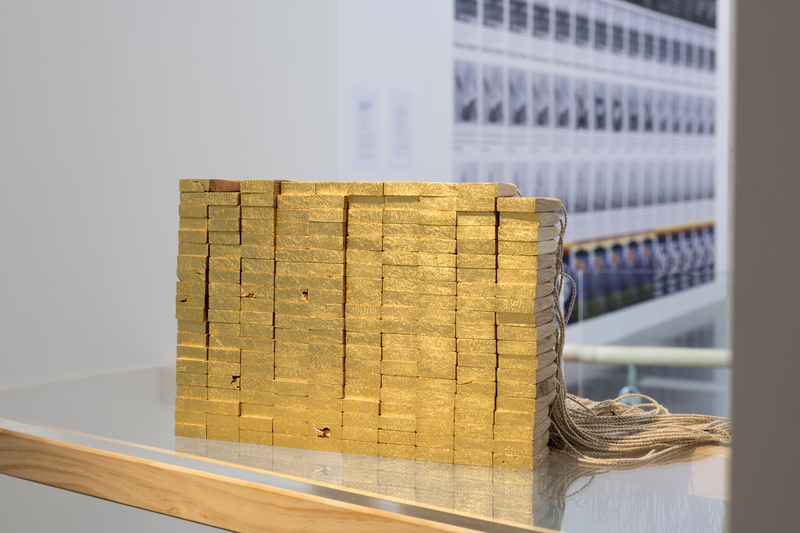 Unlike commercial jewellery, however, which is usually shown as singular pieces, its ubiquity temporarily placed in suspense, Rachel stages her multiples en mass. The status of each work fluctuates between existing as an individual object, which may have a personal value, and part of a much larger whole, which enters a wider circuit of shared associations. Blank canvas / Empty vessel undercuts the one-off piece from its pedestal. Questions about why we value certain materials, objects and forms apply as equally to the reproduction as it might to the bespoke. Significantly, Rachel’s work retains the mark of the hand-made. Although the project mimics commercial conditions, the pendants are limited editions and hand-carved. Each piece holds the possibility of a slight permutation. For Blank canvas / Empty vessel, then, it is perhaps in this space where the opportunity to make the multiple an individual exists: in the quiet decision to choose this piece, instead of that.